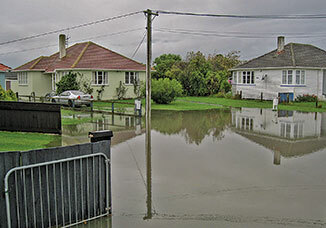 The recent flooding bought Kapiti into nationwide focus. If you were a commuter, by car or by train, you didn’t make it to Wellington, which reminded us how vulnerable we are. Slips at Paekakariki blocked roads, and flooding caused havoc. North of Otaki, Levin suffered too, and Manakau readers complained of streams overflowing their banks. So how did Otaki fare? Remarkably well. A quick trip around the usually flood-prone areas revealed nothing out of the ordinary. 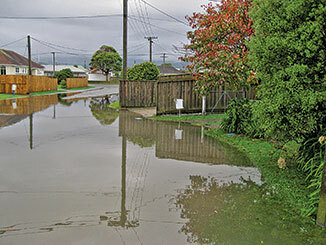 Convent Road, a regular candidate was fine, the Waitohu Stream, which can quickly turn to an angry torrent wasn’t even bank-to-bank, neither was the Otaki River. The only surface water I could find was the corner of Riverbank Road and Aotaki street, a regular lake. A letter from a reader suggested all was not well, however. The photos from Matene Place suggest that there are some troublespots. The concerned resident, when questioned said “The council sent around their contractors. They poked around the only drain in the cul de sac which did nothing. People tell me the street has flooded historically for forty years.” Not good enough, KCDC.